Valentina & Valentino first pictures. The mum is more and more often leaving the nest for 5 to 20 minutes. But when mother is out, the youngsters are almost invisible in the nest. Their feather-colour is almost the same as the branches forming the nest. As said, when mum is out, the two make themselves almost invisible and stay without any motion. But when the parent bird is back, they peek out of the nest. Can you detect both of the birds. Valentino is easy to find, but where the heck is his sister? Below is a little help. The contours may help you. On the left side is the little boy, Valentino with red contours. Valentina lays deep down and is marked with a violet frame. One or two white eggs are laid and are incubated by both parents for 13 to 18 days. [DONE] The young leave the nest within two weeks and can fly well after three weeks. So the first take-off test can be expected next week, around February 28. We’ll try to make pictures of the new pilot trainees. Cross the fingers for them and us. 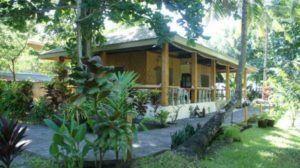 February 15, 2019 Happy Valentine’s Camiguin Style We wish you Happy Valentine's and we do it the Camiguin Style, a day too late but full of lovely and funny surprises.